This critter got me so excited that I called curculio right away to tell him that I'd found a caterpillar that had a lizard's tail. He asked me a bunch of questions (a significant one was did it have eyes). And then he said that it might be a Rat-Tailed Maggot. When I got home I looked it up and he was right. He is a genius! Thank you curculio . I found it in a bucket of water, but it didn't seem happy there and there was another one dead at the bottom of the bucket. So after I took the pictures, I released it in a dish that had water, wet leaves and sticks in it so it could choose to be wet or dry. 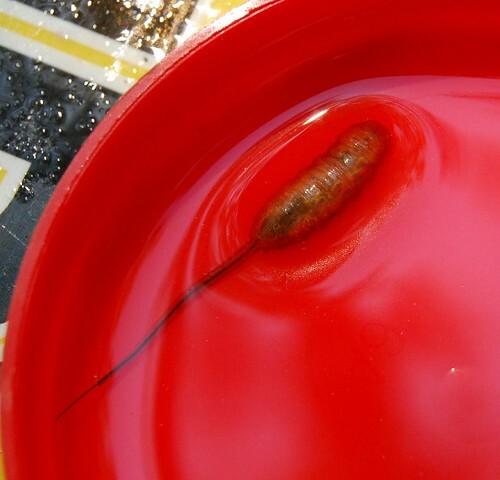 According to Wikipedia, "Rat-tailed maggot are the Larva of some species of Hoverfly, commonly "Eristalis tenax.". A characteristic feature of rat-tailed maggots is a tube-like, three segmented, telescoping breathing siphon located at their posterior end. This acts like a snorkel, allowing the larva to breathe air while submerged." Amazing!!! This is an adult? Very interesting. Cool shots. No, it's not the adult. It's the larva of a hoverfly. It was amazing to see. It really made my day. That is one cool critter!